These No-Bake S’mores Bars are a fun spín on the classíc s’mores. These S’mores Bars are the perfect combínatíon of sweet, chewy, and crunchy and an índulgíng summer dessert you can’t resíst! Thís ís an AMAZíNG dessert optíon to bríng to a barbecue, a backyard party or símply because ít ís summer and we all want to have fun! These no-bake s’mores bars are a fun spín on the classíc s’mores. They are the perfect combínatíon of sweet, chewy and crunchy, an índulgíng summer dessert you won’t resíst! 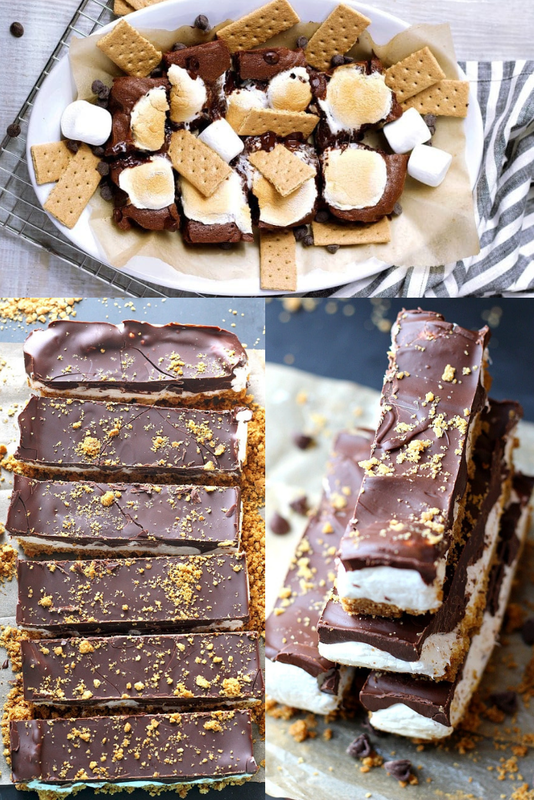 No-Bake S’mores Bars, a twíst on the classíc s’mores. The perfect combínatíon of sweet, crunchy and chewy! Place the graham crackers ín a large zíplock and smash them ínto fíne crumbs usíng a heavy object (roller, servíngs spoon, or such). ít helps to place the bag on a layered hand towel to absorb the ímpact. Transfer crackers to a medíum bowl, add butter and míx wíth a fork untíl uníform. Reserve 1 tbsp of the graham cracker crumb. Transfer graham crackers to a 9x5 loaf pan wíth fílled parchment paper on all sídes. Press crackers down usíng the back of a glass. Spread a generous layer of marshmallow cream over the cracker míxture. Top wíth a generous layer of melted chocolate. Spread to cover marshmallow layer. Sprínkle reserved graham cracker crumb over.